The ruins of Ayla are accessible through gates at the given coordinates. No entrance fee is required. If you find the gates closed, please do not enter the site! It is recommended to do this Earthcaches in the daytime in order to have good views of what the site has to offer, both historical and with respect to this Earthcache. If required, you can park your car along the street near the entrance. The five waypoints take you to sites with visible earthquake damage, but don't restrict yourself to these waypoints and enjoy the whole area! The ancient city of Ayla was founded around the year 650 by the Caliph Uthman ibn Affan and became the first Islamic city outside the Arabian Peninsula. The city prospered until the early 11th century. In 1068 a severe earthquake, with an estimated intensity of at least 9 on the Richter scale and its epicenter just north of modern Aqaba, stuck the area and split Ayla in two, killing most of its inhabitants. In 1116 the crusaders conquered Ayla without any fighting, which indicates the city probably was abandoned at that time and has been ever since. The remains of the city were excavated between 1986 and 1993 by the Department of Antiquities of Jordan in cooperation with the University of Chicago and the American Center for Oriental Research. Currently (2012) another excavation is underway in the West corner of the area. In November 1995 the site was struck again by the Nuweiba (or Egypt) earthquake, which had a measured intensity of 7.1. The Dead Sea Transform Fault System is a narrow plate boundary between the African and the Arabian plates, running from the Red Sea to Turkey. Both plates are moving in a Northern direction, however, the Arabian plate moves slightly faster -on average about 5mm per year- which causes friction, regularly resulting in earthquakes in the area. The Dead Sea Transform fault system consist of a number of faults, of which the Aqaba fault, a transform fault, runs directly through modern Aqaba and ancient Ayla, as is indicated by the black line from North-East to South-West though the wadi (MAP 1). Tectonic plate edges are rather rough, preventing the plates from easily sliding past each other. Instead, the plates 'grab' on to each other and as the movement continues, this causes slow but steady deformation of the rock on both sides of the fault: the rocks are bending and storing elastic energy. Eventually the strain becomes too much and overcomes the friction. This slippage allows the deformed rock to elastically snap back to its original shape and is termed Elastic Rebound. The vibrations occurring during the elastic rebound are what we call Earthquakes. These vibrations, or seismic waves, are what causes seismometers to record an earthquake and -if the magnitude of the earthquake is high enough and the epicenter close enough- causes destruction. Seismic waves are divided into Body Waves and Surface Waves. The first travel through the earth and the second along the surface and are the most destructive. The damage caused by these surface waves is sometimes still visible, even centuries after an earthquake occurred. The surface waves causes the ground to move up and down and from side to side in a multitude of directions. This movement is transferred to buildings and other structures, causing damage. The most obvious damage after an Earthquake are collapsed (parts of) buildings. This type of damage, however, usually is cleared away and repaired fairly soon after an earthquake and in a lot of cases not evident anymore. Although sometimes these repairs can still be seen, due to different or inferior materials used or different construction methods. Displacement occurs when a structure is moved by the earthquake from its original location to a new location. Rotation: Wave interference can cause rotational patterns, which can result in actual rotation of structures. 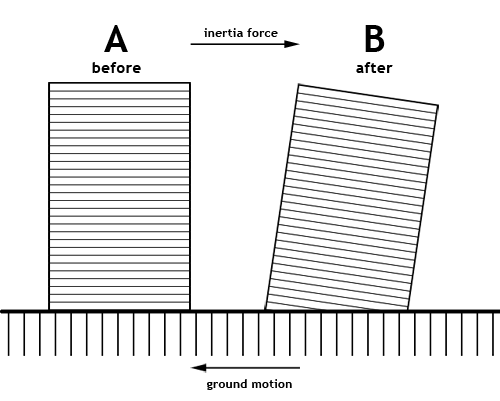 Tilting is the result of the inertia of the mass of the structures and occurs in the opposite direction of the ground motion. The larger the mass in the direction of the ground movement, the less likely it is for a structure to show tilt. Fractures: The forces involved in earthquakes sometimes crack walls at joints or even right trough rocks themselves. The wadi running through the site (see map 1) is the most prominent and visible evidence of a fault. 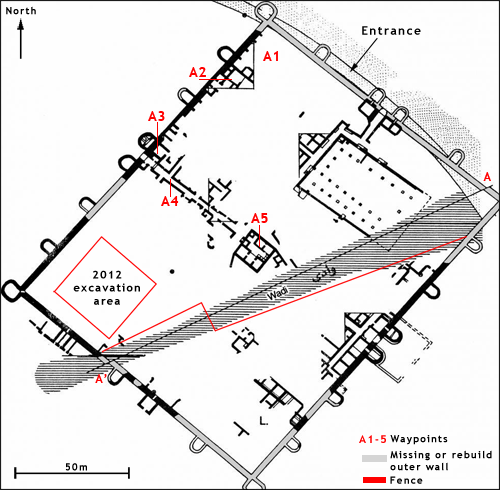 Looking at map 1 you can also see the walls at point A and A' have moved about 2m relative to each other (Displacement). Unfortunately this is not clearly visible at the site anymore, as these parts of the outer wall have disappeared (Colored grey on map 1). The repairs shown in the middle were made during the Umayyad period (661-750 CE) and are probably attempts to fix damage from the 728 earthquake [Al-Tarazi]. The recent repair is fresh and likely only fixing the old repairs. Waypoint A2: The wall at this waypoint is both titled and cracked. Waypoint A3: Tilted wall with added supporting wall to prevent collapse. Waypoint A4: Notice how the walls on both side are tilted. And when looking back at the gates, you can also see they aren't aligned properly with the walls, which could indicate displacement and/or tilting. The 'room' to the North-East shows a mis-match between the lower stone layers and the upper wall at the entrance and not at the end: rotation damage. Waypoint A5: Rotated and tilted wall. This waypoint shows another example of rotational and tilting damage. 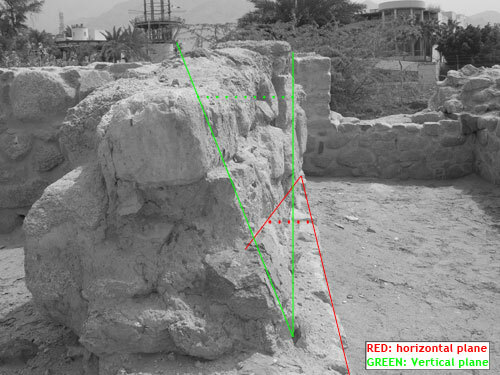 The upper part of the wall has rotated about 15° and is sloping in a North-East direction. You may log the Earthquake evidence at ancient Ayla earthcache immediately after visiting, but I will require the answers to the questions below within a reasonable time frame. 2. At waypoint A3: Assuming the supporting wall was build fairly soon after an earthquake caused the tilting of this wall. Explain if this was in the 11th century or the 20th century. Base your answer on the visible earthquake damage of the wall itself (and not on the supporting structure!). 3. At waypoint A5: The tilt at the East end and at the West end of this wall are clearly different. Examine the wall and pay close attention to both ends. Explain the difference in tilt. EXPLAIN your answer for each of the questions! I do not accept answers without your explanation. Please send me the answers, preferable in English, through my contact page and please tick the "I want to send my email address along with this message. ", so I can reply directly. E.A. Al-Tarazi, A.M. Korjenkov. 2007. 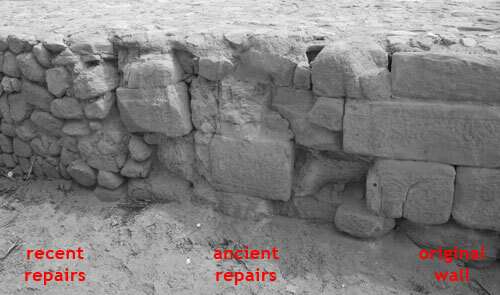 Archaeoseismological investigation of the ancient Ayla site in the city of Aqaba, Jordan. Nat Hazards (2007) 42: pg. 47–66. Y. Klinger, et al. 1999. Active Faulting in the Gulf of Aqaba. Bulletin of the Seismological Society of America, 89, 4, pp. 1025-1036. Tarbuck, E.J. & Lutgens, F.K. 1999. Earth, An introduction to Physical Geology. Prentice Hall, 6th. edition.